At first blush, it seems contradictory that the word “inclusion” means embracing something or someone that’s both a part of and foreign to a larger body. And yet, both in science and religion, that’s exactly the point. The collective is defined not by a set of shared characteristics but of shared values, chief among them diversity and access. Diversity and access haven’t always been obvious features of Jewish communities. Historically, social mores embedded within Jewish law and custom conspired to guard the gates of our congregations, camps and schools from such intruders as intermarriage and sexual and gender diversity. Yet, those same social mores often obscured the very mandate for inclusion that serves as the bedrock of our tradition. As we learn from Pirke Avot 4:3, “Do not disdain any person. Do not underrate the importance of anything—for there is no person who does not have his (or her) hour, and there is no thing without its place in the sun.” In obscuring these values, some of our own relatives and friends, indeed some of us, may also have become hidden. 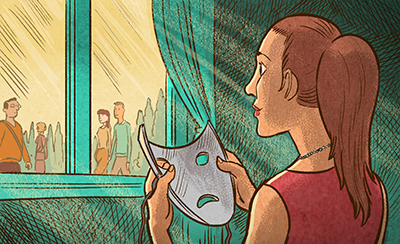 Unmasking ourselves and living our truth is the core lesson of both Purim and Pesach. There are similarities in their stories: Esther passes as a Persian, Moses as an Egyptian. Esther enjoys sanctuary in Ahasuerus’s palace, Moses in Pharaoh’s court. Esther’s transition begins when she learns her people are in danger, Moses’ when he sees his fellow Jew beaten. But there is one major difference: God is at the center of the Pesach freedom story, whereas God is entirely absent from the Purim story as Esther and Mordechai courageously assert their identity and claim their rightful place within Persia. In a surprising twist of Jewish wisdom, Purim outranks Pesach in the rabbinic hierarchy of Jewish festivals. This minor holiday, associated with noisemakers, drunken revelry and costumes, outshines the drama and seders of Pesach, the most popular American Jewish holiday. Why would this be? What is transformative and sustaining both for individuals and their communities regarding Purim is personal truth. Theories abound about why we dress up on Purim—cultural borrowing from European pre-Lent festivities, Esther hiding her Jewish identity, God’s concealed presence—but the essence of the holiday is the unmasking it celebrates, the human revelation of inner and outer truth that too often becomes concealed as we navigate our complex world. As the rabbi of Sha’ar Communities, in partnership with my then-intern, Sam Price (may her memory be for a blessing), I launched an annual Unmasquerade Ball three years ago in New Jersey. This event for LGBTQ Jewish teens and allies uses Purim as a safe setting to remove their masks. Sam, a transgender woman and junior at Oberlin College, was a leader in the campus Jewish and queer communities who dreamed of becoming a rabbi. Deeply aware of the world’s varied beauty, the only beauty Sam couldn’t accept was her own. While 50 teens gathered at the third Unmasquerade Ball in 2016, Sam took her last breaths, succumbing to her suicide attempt a week earlier. Inclusion isn’t merely a matter of values; it’s a matter of life and death. Perhaps Purim’s immortality serves to ritualize life’s irrepressible instinct to be revealed and made manifest with ever more complexity and diversity, embedding itself not only within the science of evolution, but also within our souls, families and communities. This kind of inclusion cannot be imposed by miracles from above; it can only be embraced with earthly courage and humility. Inclusion is not a gesture of welcome to one who looks, thinks or behaves like us, but one who dreams, dares and loves like we do. Rabbi Adina Lewittes, founder of Sha’ar Communities, offers creative gateways into Jewish engagement. What a beautiful article. My brother Adam Edelman and his family also lost their beloved Sam Edelman February 20, 2016 to suicide. Sam was just beginning the transgender process. My brother Adam and Adam Price have become friends. Thank you for this article. My heart breaks for the Price family and my own family over the loss of what could have been.